Alpacas: Guardian Angels for Sheep? Predator attacks on livestock are a major cause of human-wildlife conflict seen not only in Australia but around the world. The use of guardian animals to protect another domesticated species has been used globally as a form of predator deterrent. However, there is little scientific based evidence in relation to alpacas as guardian animals. In this research we aim to gain an understanding as to how producers are currently using alpacas as guardian animals in the form of an online survey. The survey will also focus on whether producers have found alpacas to be effective in reducing issues with feral pests and lamb mortalities and gain information on producer attitudes toward what makes an alpaca an appropriate guardian animal. To better understand the factors influencing the effectiveness of alpacas as guardian animals we first need to gain knowledge about the mechanisms surrounding livestock guarding. 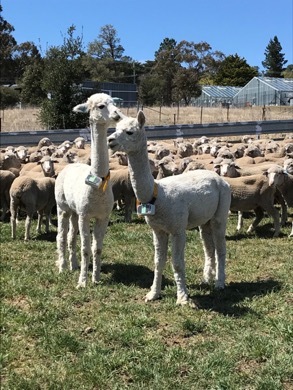 Therefore, another component of this work is to conduct a series of behavioural experiments to explore the behavioural patterns of alpacas when cohabitating with ewes and lambs. This includes developing an ethogram for alpacas and examining how alpacas interact with the livestock they are protecting. To gain an insight into alpaca behaviour we aim to use a number of strategies including field observations and GPS collaring for spatial information. We aim to gain understanding into alpacas as guardian animals and examine how these animals can be utilised to reduce lamb losses and therefore contribute to the success of our sheep industry.